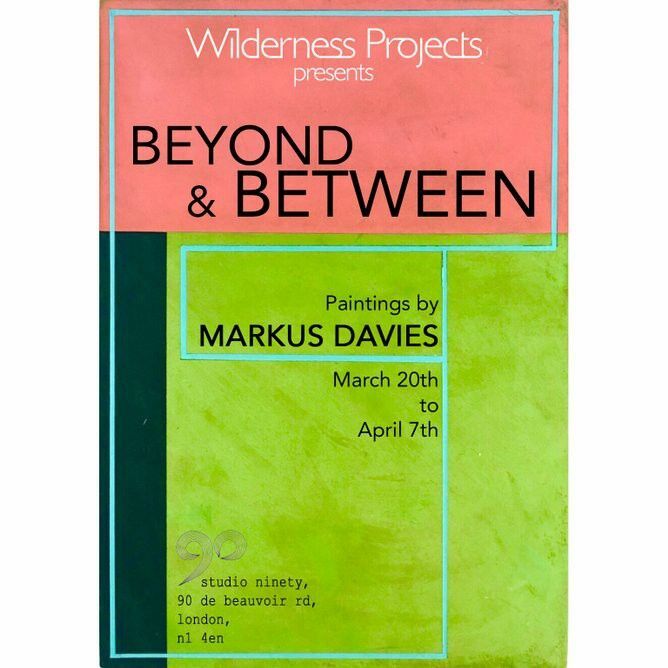 We at Wilderness Projects are proud to present our fourth exhibition at Studio Ninety - Beyond and Between by Markus Davies. The show opened today and will run through until April 7th. Studio Ninety welcomes visitors to the exhibition from Tuesday - Saturday, 12 - 6pm or by appointment. Please do email us I feel you wish to wish to visit. Markus Davies’ paintings are an abstracted, interpretive response to the built environment through which he travels. They are a personal evaluation of his daily surroundings, addressing the simple experience of the transitory moments he lives. 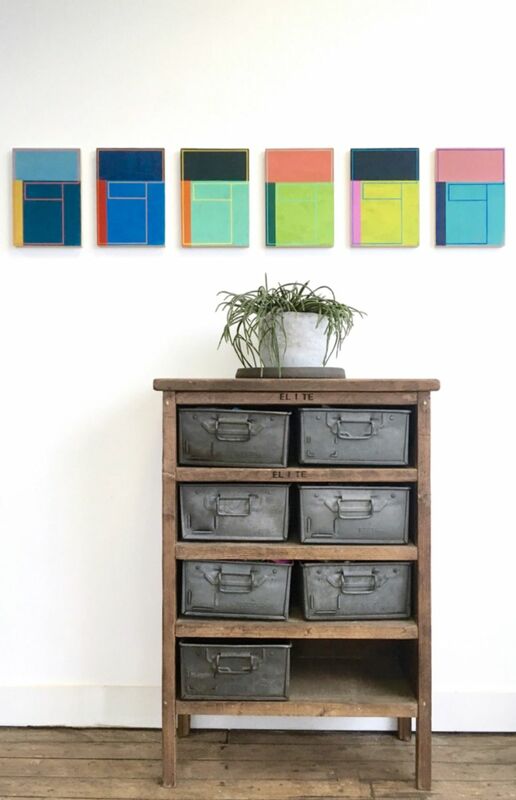 His colours are chosen intuitively - often lifted and re-contextualised as he discovers them within daily life, and his distinct geometric compositions are informed by anything he encounters, from buildings and road signs to commercial packaging. 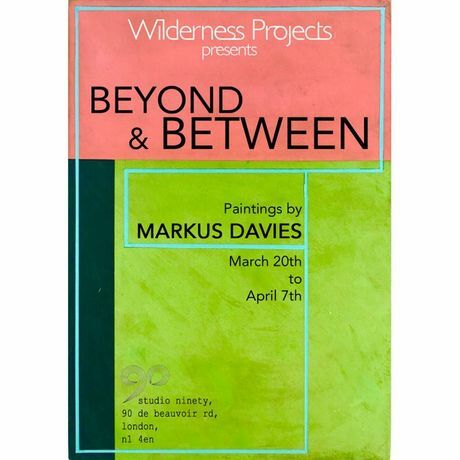 The works exhibited in Beyond and Between comprise three unified and distinct series. The repetition of compositional structures is a relatively new introduction to Davies’ practice and this fresh adjustment has allowed him to explore the nuance of colour, tone and texture from one painting to the next. The works offer us a splendid example of the manner in which such things may radically transform the way we read a painting’s visual weight, atmosphere or temperature and, happily, encourage us to indulge for a moment in the simple pleasure of looking. Davies strives to capture the impressions and memories of existing in his everyday spaces. Developed from his understanding and experience of the urban landscape, his paintings combine a multitude of fragments of visual and emotional data and distill them into controlled, sensitive, beautiful objects. Although their immediate appearance is one of painstaking construction, and clearly these are paintings that take time and skill, this fine work disguises the spontaneity and improvisation of the initial address. He starts loose, building painterly surface and intuitively balancing colour and only when this has settled to a successful balance does he begin to hone that measured finish. It is this approach, developed with skill over some time, that marks Davies out as a versatile and skilled artist, and a rare one in his ability to combine contrasting techniques into resolved, composed, confident paintings.